Victoria's Said The Whale are preparing for the March release of their new full length with the release this week of the New Brighton EP. This delightful dose of melodic folk/pop should serve well in tiding fans over until the album appears. The four songs on the album are pretty much standard fare for Said The Whale. The songs are catchy, peppy roots-tinged numbers, with a healthy heaping of Canadiana imagery. The standout is undoubtedly the lead single "Lines". The title likely refers to the strings used to secure the song's killer hooks. 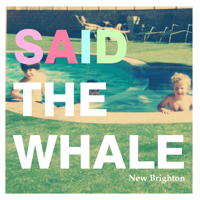 The band never threaten to break new ground on the EP, but it does reassure us that Said The Whale are unlikely to suffer from a sophomore slump. It makes me eager for March. Said The Whale play The Phoenix in Toronto on December 8th & 9th with Tokyo Police Club and Born Ruffians.